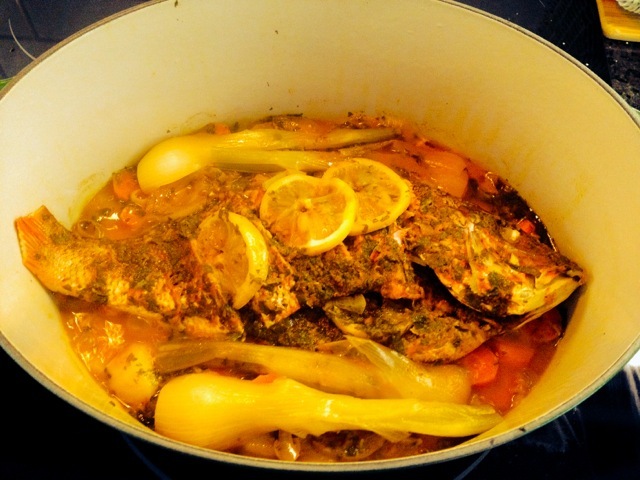 A healthy and wholesome dish that is now my family’s favorite fish dinner dish. 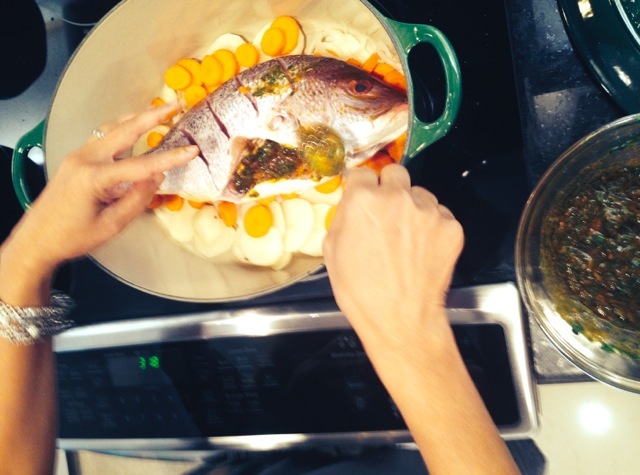 The Red Snapper I bought for this dish today was too big for the tagine I had planned to use. So I used my dutch oven instead which was the perfect size. The pictures are not the greatest, so I’ll update when I cook this again. 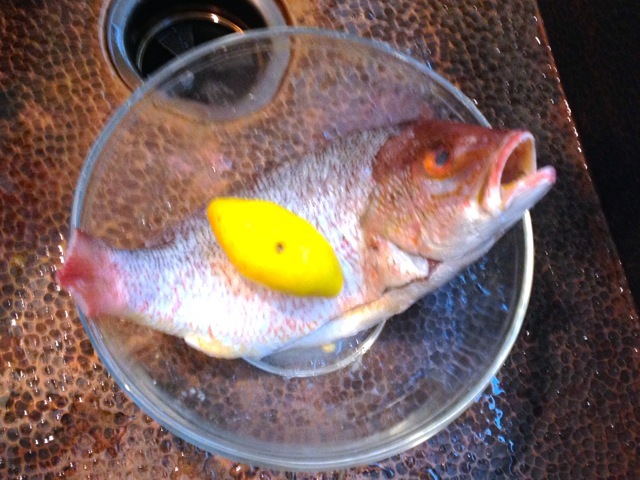 Fish, one whole fish cleaned with salt and lemon and rinsed with cold water. 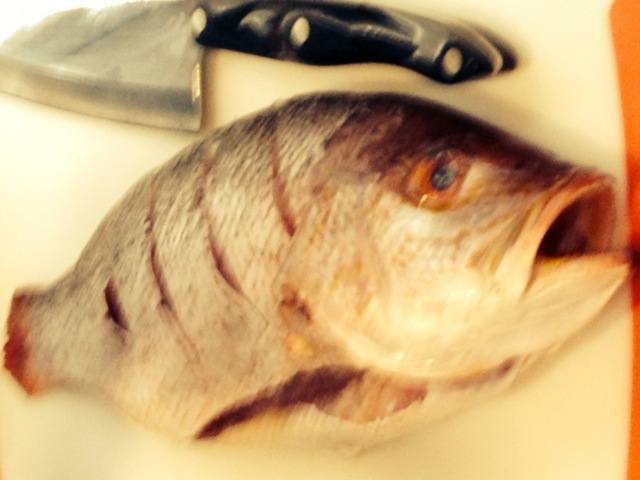 Make three big cuts in the side of the fish to help it absorb the marinade and cook evenly. 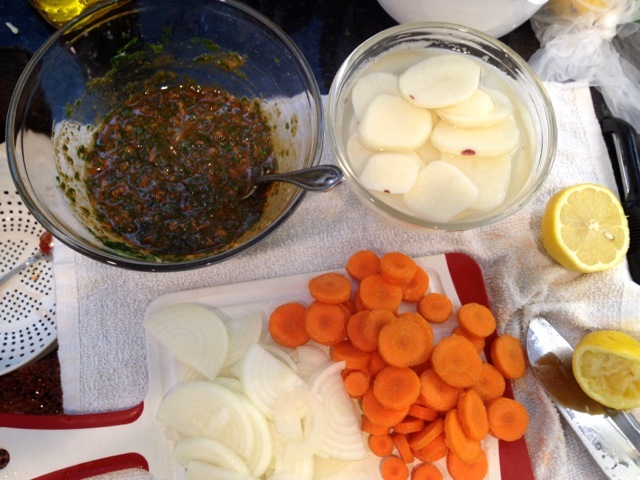 The Charmoula (marinade) can be made in advance and kept in the fridge for up to two days. Mix all the Charmoula ingredients together in a bowl. 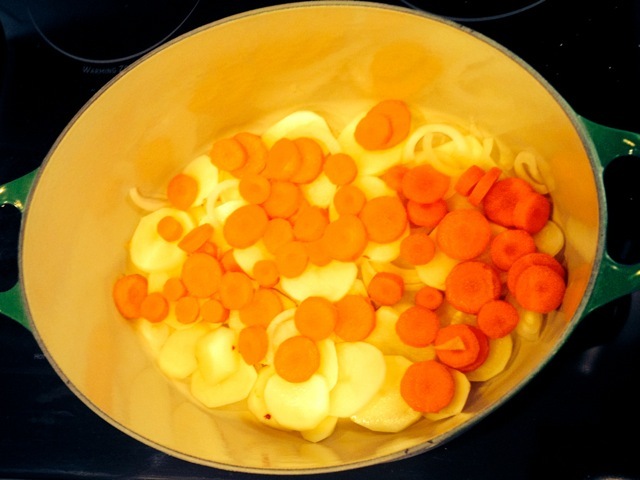 Prepare the vegetables: peel and slice onions and potatoes (put potatoes in water while you wait), scrape and slice carrots. 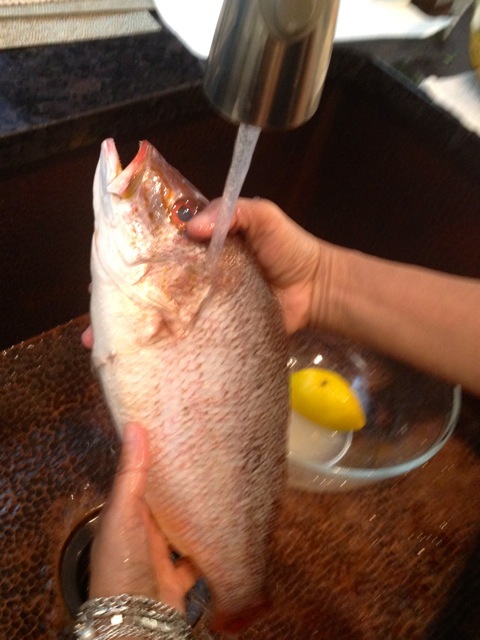 Clean the fish gently with salt and lemon juice. Make three or four deep cuts in the fish to help absorb the marinade. 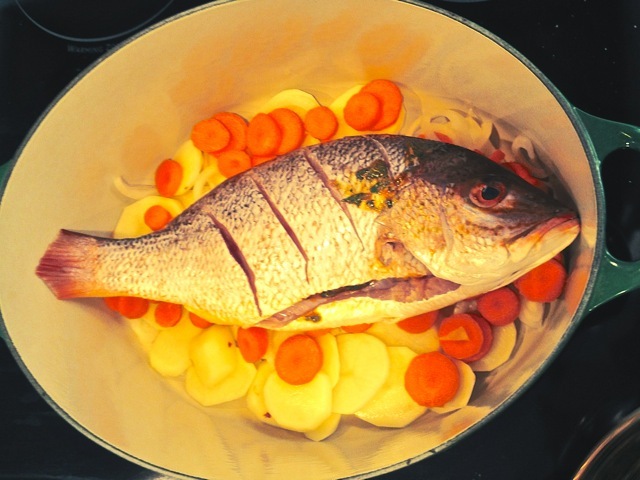 I started by layering everything in a tagine (recently bought a nice one at Le Crueset) and found the Red Snapper we bought today was way too big. So I transferred everything into my dutch oven, also Le Crueset. Put the fish on top of the vegetables. 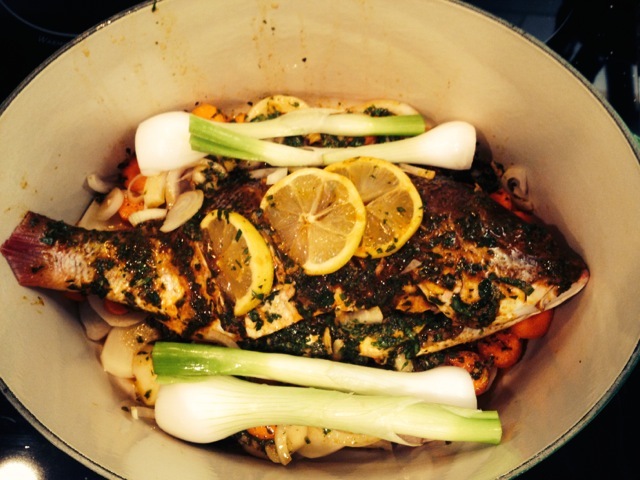 Use about half of the Charmoula to marinate the fish inside out. Flip it over and make sure you coat the other side too, then flip it back so the cuts are on top. Stick sliced lemons into the cuts (It will look much nicer if you make the cuts so the lemon slices are going in the other direction. I will do that next time. ) I added leeks at the end. They were a special request from my kids. Cover and cook on low heat for an hour. I used a 3 on my electric stove. I made some quick preserved lemons to serve on the side. This is served as a condiment, just enough for a 4 person meal. 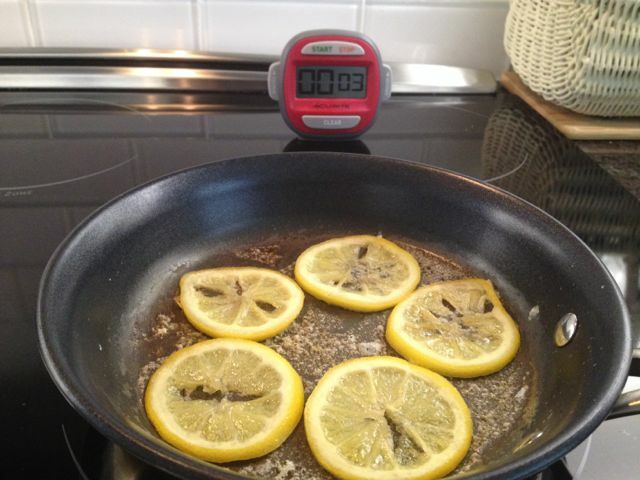 In a frying pan, arrange the lemon slices so they don’t overlap. Add lemon juice and sprinkle salt over them. 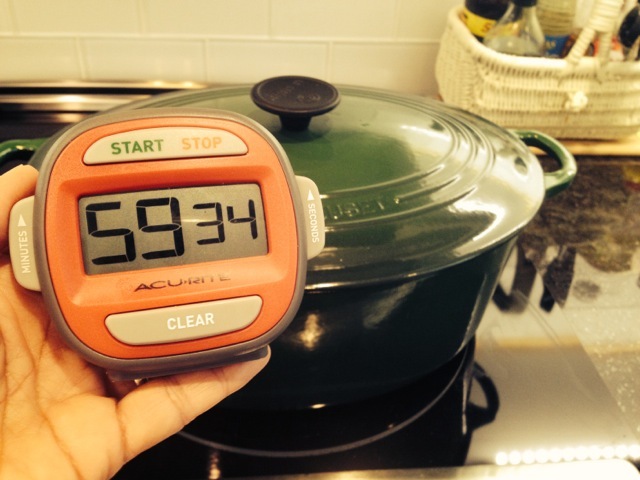 Cook on low heat uncovered for 10 to 15 mins depending on your stove. Once they’re tender and the liquid is dried up, they’re done. Store them in an airtight container in the fridge and serve with any dish for some extra zest. Lemons after 10 mins. I added a little more juice and cooked an additional 5 mins.